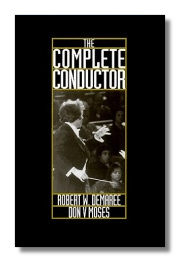 This list provides an overview of books about conductors and conducting, including biographies and the philosophy and mechanics of leading ensembles. The Complete Conductor: A Comprehensive Resource for the Professional Conductor of the Twenty-First Century. Robert W. Demaree, Jr., Don V. Moses, David Moses. Prentice Hall Press. 1994. ISBN 0131730142 (hardcover). For a one/two-semester course in Basic Conducting, Introduction to Choral Conducting, Introduction to Instrumental Conducting. Direct, practical, and comprehensive, this text addresses the conducting needs of beginners through working professionals. Using a modular structure that allows a focus on either choral or instrumental content – or both – it covers conducting theory, style periods, technical problems, and conducting patterns – using examples ranging from short works to multi-movement masterpieces. The Compleat Conductor. Gunther A. Schuller. Oxford University Press. 1997. ISBN 0195063775 (hardcover), 0195126610 (paperback). In world renowned conductor and composer Gunther Schuller's highly provocative critique of modern conducting, he castigates many of this century's most venerates conductors for using the podium to indulge their own interpretive idiosyncrasies, rather than devote themselves to reproducing the composer's stated intentions. 937 music examples and 35 tables. 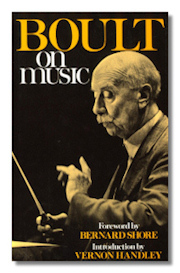 One of the twentieth century's best-loved conductors, Sir Adrian Boult often wrote and broadcast on music during the course of his long life. His style of expression, whether writing, speaking or conducting, was always concerned with directness of communication. Boult on Music assembles the most important of Sir Adrian's broadcast essays and talks, exploring many aspects of his art. He discusses composers he knew and worked with, like Elgar and Vaughan Williams, as well as such figures as Schubert and Bach. He examines the craft of his conducting colleagues, like Toscanini, Wood, Nikisch and Beecham, and of fellow musicians like Menuhin and Casals. He also turns his attention to the problems and practicalities of the conductor's task. The Grammar of Conducting: A Comprehensive Guide to Baton Technique and Interpretation. Max Rudolph, with Michael Stern. Schirmer Books. 1995. ISBN 0028722213 (hardcover). Provides a comprehensive introduction to the techniques and practical concerns of leading an orchestra. The text proceeds from basic conducting patterns to sophisticated explorations of performance and rehearsal techniques. 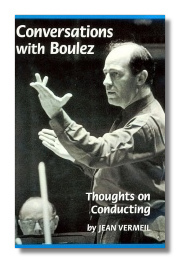 Conversations With Boulez: Thoughts on Conducting. Pierre Boulez, et al. Amadeus Press. 1996. ISBN 1574670077 (hardcover). A giant of postwar music and the most powerful figure in the contemporary French music scene, Pierre Boulez talks about his career as one of the world's most controversial conductors and daring programmers of musical text. These candid interviews give us vintage Boulez: his bold views, enigmatic wit, practical wisdom, and uncompromising beliefs. Memoirs: Sir Georg Solti. Harvey Sachs & Sir George Solti. Alfred A. Knopf. 1997. ISBN 067944596X (hardcover), 1556523378 (paperback). One of the great music makers of our time has written a memoir as rich in event and adventure as it is in its reflections on, and insights into, music. He tells the story of a musical education that began in his native Budapest when his mother recognized and helped foster his talent. It continued with his studies at the rigorous Liszt Academy with Dohnányi, Kodály, Bartók, and Weiner, and a performance he heard of Beethoven's Fifth Symphony, conducted by Erich Kleiber, that forever set his destiny. He recounts his prewar experience coaching opera in Budapest, his exile in Zurich during World War II, and his work as music director of the Bavarian State Opera and life in postwar Munich. He then moves on to similar posts in Frankfurt and in London at Covent Garden. We watch as he continues his journey through the top ranks of the musical world and becomes, in 1969, director of the Chicago Symphony, a post he holds with brilliance and renown for twenty-two years. We follow him from 1991 on as he pursues for the first time the challenges and joys of the freelance conductor, working in Salzburg, Paris, Vienna, Berlin, New York, and St. Petersburg. Solti expresses his feelings and thoughts about Richard Strauss, Igor Stravinsky, and other great composers. He writes about conducting, and about Wagner's Ring cycle as well as operas by Mozart and Verdi, and symphonies by Mahler, Beethoven, and Bruckner. We see him continuously developing as an artist, constantly probing the composer's intentions: He describes how he found new insights into Beethoven's Ninth Symphony upon returning to it after many years, and how he approached new recordings of the Mozart operas and Wagner's Die Meistersinger ("This time I would come to it with my heart as well as my head"). His memoirs are filled with both hilarious and touching scenes of rehearsal and performance, as well as with stories of musical controversies. He speaks about the great musicians he has worked with, among them Toscanini, Walter, Furtwängler, Klemperer, Nilsson, Hotter, Domingo, and Rostropovich. Throughout, he reveals the pleasure of interpreting the composer's design, and the satisfying act of making a score come to life. Beyond The Baton: What Every Conductor Needs to Know. Diane Wittry. Oxford University Press. 2007. ISBN 0195300939 (hardcover). 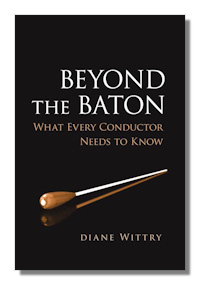 Seasoned conductor Diane Wittry draws a comprehensive roadmap to a successful career in Beyond the Baton. With first-hand understanding of how the role of the conductor has changed across the years, she expertly examines the new set of duties – both on and off of the podium – that now fall upon the shoulders of the music director. From getting a job to fundraising and educational outreach, Wittry's comprehensive tips and strategies guide students and professional conductors alike through the leadership and organizational skills necessary for success. Numerous real-life examples illustrate vital skills for artistic leadership such as programming subscription, pops, and educational concerts; understanding the budget and the music director's role in funding the artistic vision; and presenting speeches, and radio and televised interviews. In informative conversations with the author, successful conductors Leonard Slatkin, Robert Spano, and JoAnn Falletta offer tips from personal experience on how music directors can work successfully with orchestras, and what their roles are with the board and the community. Read the Classical Net Review of this book. Of Music and Music-Making. Bruno Walter, with Paul Hamburger (translation). Reprint Services Corp. 1977. ISBN 999112599X (hardcover). The original book was published in German in 1957. Walter offers fascinating insights to his philosophy of conducting. A non-technical discussion.